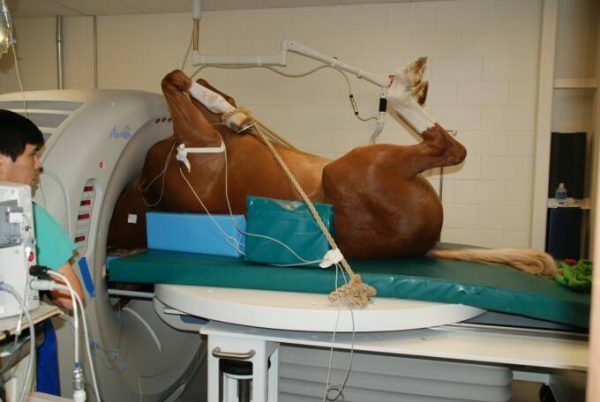 Equus CT is a system for CT scanning of horses (camels, llamas, large cats, etc.) at veterinary teaching universities and private clinics. The EquusCT automatically synchronizes with the movement of the CT couch without any electrical or mechanical interfacing. The EquusCT operates with any CT, is easy to use, and provides the practitioner with a breakthrough tool that enhances the diagnosis of a patient’s condition. The table moves manually and is capable of supporting a 2,100 lb (953 kg) horse. The floating carousel provides the ability to finely position the patient with the CT gantry for scanning. The carousel floats in a transverse, linear and circular motion. The carriage has a linear motion range of 36” (915 cm) for scanning.